Israeli soldiers abducted, on Friday at dawn, one Palestinian, and reportedly confiscated weapons, in the southern West Bank governorate of Hebron, in addition to confiscating cash in Tulkarem, in northern West Bank. Media sources in Hebron said the soldiers invaded and searched homes in Qalqas area, east of the city, and abducted Yousef Sbeih Abu Sneina, 24. 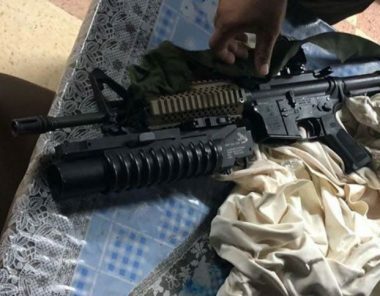 Furthermore, the army said its soldiers located an M16 rifle, and a shoulder rocket launcher, during searches in the Sammoa’ town, south of Heron, but did not report any arrests. In related news, the soldiers confiscated thousands of Shekels from homes in Tulkarem, in northern West Bank, and claimed the money is meant to provide aid to armed fighters.